Astrom Editions AB - Volume IX, 1995. P. Åström, Pictorial Representations of Hedgehogs at Hala Sultan Tekke. H.-G. Buchholz, Zur religiösen Bedeutung mykenischer Igel. P. Flourentzos, A Unique Scene on a Cypriote Red Polished Jug. K. Nys, The Use of Masks in Cyprus During the Late Bronze Age. D. Reese, Equid Sacrifices/Burials in Greece and Cyprus: an Addendum. M. Ripinsky-Naxon, Cognition, Symbolization, and the Beginnings of Shamanism. 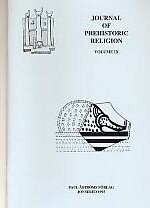 M. Otte, The Prehistory of Religion: Data and Method. Redigerad av Paul Åström & Jon van Leuven. 80 sidor. ISBN: 978-91-7081-097-8.